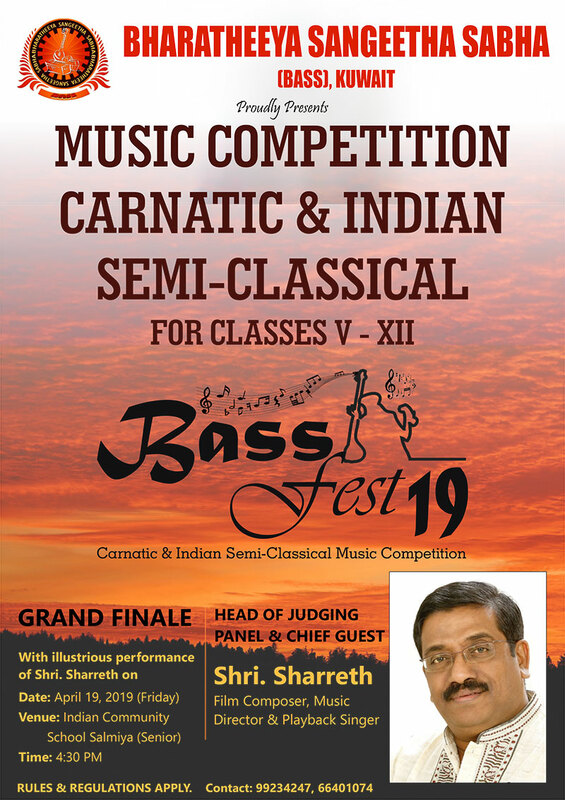 Bharatheeya Sangeetha Sabha (BASS) Organizing mega Music Competition in Carnatic Music & Semi Classical Music (Film Songs), first time in Kuwait with exceptionally professional judging panel. Eminent Film Composer, Music Director and Playback Singer Shri. Sharreth will be the head of Judging Panel and Chief Guest for the event. The first round auditions for the Mega competition will be held on Thursday 11th & Saturday 13th of April 2019 at United Indian School, Abbasiya and Grand Finale will be on Friday 19th April 2019 at Indian Community School (Senior), Salmiya. Along with illustrious performance of Shri. Sharreth & renowned instrument artists team from India will also perform “Mega Indian Musical Night 2019” with songs from Malayalam, Tamil, Telugu, Kannada and Hindi movies. wow, wonderful, eagerly waiting for the music Legend performance, thanks BASS team for arranging a wonderful platform for the music learners. Wow what a great initiative by BASS to singers in Kuwait, i would be highly honored for the Carnatic & semi Classic singers of Kuwait to sing in front of the Legend.